I can't believe it is Thanksgiving time already! I have a love, hate relationship with the month of November. I love the weather, meal planning, decorations, food, and family. I dislike (I really don't like to use the word hate) my husband's work schedule. As a butcher in a three generation family business (meat market to be exact), the months of November and December are C.R.A.Z.Y. We always joke that we will see him after the first of the year. :) I asked him a few months ago if he would be willing to give me some important pointers when it comes to the Thanksgiving turkey or also known as "Tom". He was more than happy to share the information for my blog. In fact, there is so much information that I am going to break it down into separate parts. Today, we will focus on Part 1, pre-game or prep time. 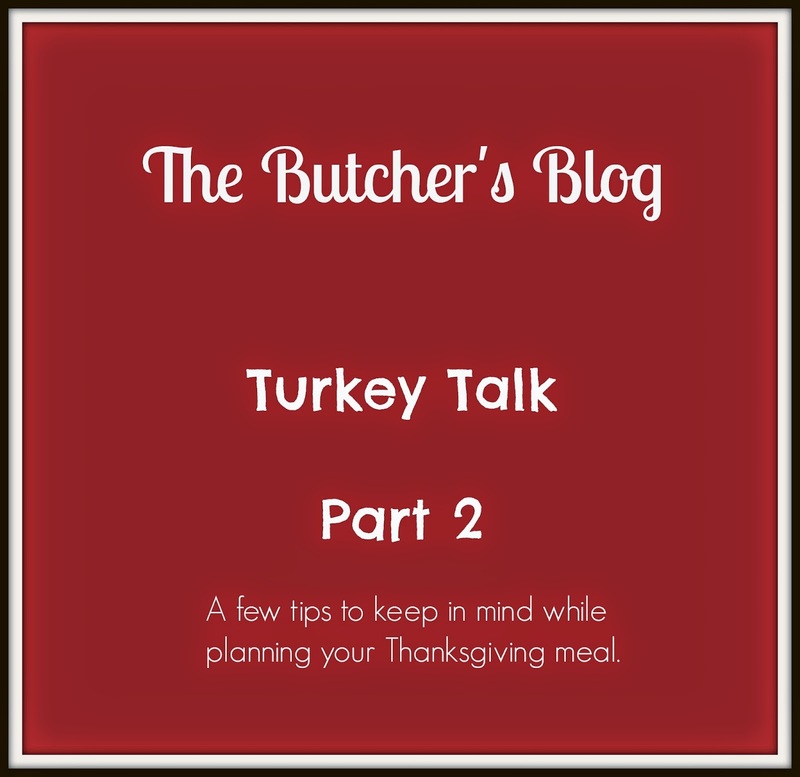 Q: How should I determine the size of turkey I should purchase? A: Typically you should estimate 1lb. per person (when picking a whole turkey). If you are planning to feed 20 people go with the minimum of a 20lb. bird. A 20lb. bird will give you approx. 8-9lbs. of meat after it is cooked. Most people eat about an 8oz. portion of turkey. So, when you are looking for a whole turkey the rule of thumb is 1lb. per person before the turkey is cooked. Also, if you love leftovers you may want to go a couple pounds larger. 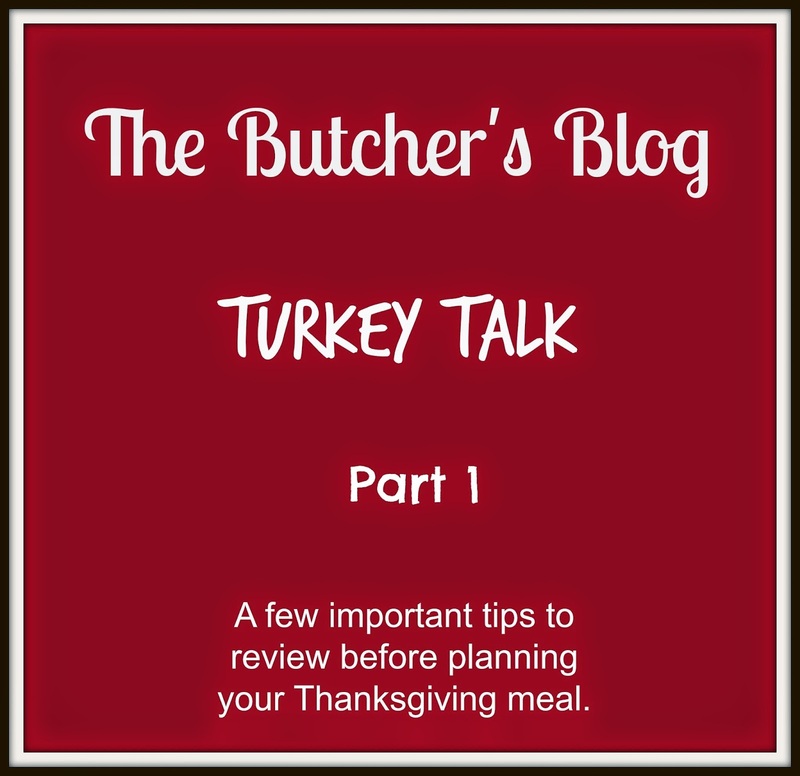 Q: How should I thaw my turkey? A: Always thaw the turkey in a refrigerator or an area that is 41 degrees or less. NEVER THAW THE TURKEY ON YOUR KITCHEN COUNTER. When thawing the bird in the fridge, give yourself two to three days of thaw time. Also, always place the bird on a tray or baking sheet and put on the bottom shelf of the refrigerator. This will keep from the turkey juices from spreading and contaminating any other food in the fridge. Q: Do I need to wash the thawed turkey? A: Right before the turkey goes in the oven, smoker, or fryer make sure you wash the turkey inside and out with cold water. Remove the giblets and neck from the inside of the bird. 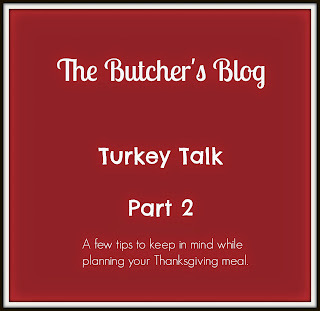 Q: How do I know when the turkey is completely done and safe for eating? A: 165 degrees is the magic number for any type of poultry. Make sure to have a meat thermometer to keep an eye on the temperature. Place the meat thermometer in the thigh at the hip joint. This area takes the longest to cook. If this area reads 165 degrees you can be sure the rest of the bird is finished. Q: Breast up or breast down? A: If you are presenting the bird and carving it in front of your family and guests, you will want to bake it breast up. If you plan on carving the bird in the kitchen or before your guests arrive, bake it breast down. Baking the bird breast down is not the prettiest but it will keep the breast meat juicy. I am hoping the next Turkey Talk post will define different types of turkeys. For example, the difference between organic vs. free range etc.